Since this is now wiki editable, I am giving control up to the community. If you have a suggestion, please put it in this section. I decided to also add a section for general be a better programmer books and online references as well. Once again, all recommendations are welcome. Foundations of Programming By Karl Seguin - From Codebetter, its C# based but the ideas ring true across the board, can't believe no-one's posted this yet actually. How to Write Unmaintainable Code - An anti manual that teaches you how to write code in the most unmaintable way possible. It would be funny if a lot of these suggestions didn't ring so true. Just the Basics To get a feel for a language. Code Complete - This book goes without saying, it is truely brilliant in too many ways to mention. The Pragmatic Programmer - The next best thing to working with a master coder, teaching you everything they know. Mastering Regular Expressions - Regular Expressions are an essential tool in every programmer's toolbox. This book, recommended by Patrick Lozzi is a great way to learn what they are capable of. Algorithms in C, C++, and Java - A great way to learn all the classic algorithms if you find Knuth's books a bit too in depth. This tutorial seems to pretty consise and thourough, looked over the material and seems to be pretty good. Not sure how friendly it would be to new programmers though. K&R C - a classic for sure. It might be argued that all programmers should read it. C Primer Plus - Suggested by Imran as being the ultimate C book for beginning programmers. C: A Reference Manual - A great reference recommended by Patrick Lozzi. The tutorial on cplusplus.com seems to be the most complete. I found another tutorial here but it doesn't include topics like polymorphism, which I believe is essential. If you are coming from C, this tutorial might be the best for you. Another useful tutorial, C++ Annotation. In Ubuntu family you can get the ebook on multiple format(pdf, txt, Postscript, and LaTex) by installing c++-annotation package from Synaptic(installed package can be found in /usr/share/doc/c++-annotation/. The C++ Programming Language - crucial for any C++ programmer. C++ Primer Plus - Orginally added as a typo, but the amazon reviews are so good, I am going to keep it here until someone says it is a dud. Effective C++ - Ways to improve your C++ programs. More Effective C++ - Continuation of Effective C++. Effective STL - Ways to improve your use of the STL. Thinking in C++ - Great book, both volumes. Written by Bruce Eckel and Chuck Ellison. Programming: Principles and Practice Using C++ - Stroustrup's introduction to C++. Accelerated C++ - Andy Koenig and Barbara Moo - An excellent introduction to C++ that doesn't treat C++ as "C with extra bits bolted on", in fact you dive straight in and start using STL early on. FORTH, a text and reference. Mahlon G. Kelly and Nicholas Spies. ISBN 0-13-326349-5 / ISBN 0-13-326331-2. 1986 Prentice-Hall. Leo Brodie's books are good but this book is even better. For instance it covers defining words and the interpreter in depth. Sun's Java Tutorials - An official tutorial that seems thourough, but I am not a java expert. You guys know of any better ones? Head First Java - Recommended as a great introductory text by Patrick Lozzi. Effective Java - Recommended by pek as a great intermediate text. Core Java Volume 1 and Core Java Volume 2 - Suggested by FreeMemory as some of the best java references available. Java Concurrency in Practice - Recommended by MDC as great resource for concurrent programming in Java. Python.org - The online documentation for this language is pretty good. If you know of any better let me know. Dive Into Python - Suggested by Nickola. Seems to be a python book online. perldoc perl - This is how I personally got started with the language, and I don't think you will be able to beat it. Learning Perl - a great way to introduce yourself to the language. Programming Perl - greatly referred to as the Perl Bible. Essential reference for any serious perl programmer. Perl Cookbook - A great book that has solutions to many common problems. Modern Perl Programming - newly released, contains the latest wisdom on modern techniques and tools, including Moose and DBIx::Class. Adam Mika suggested Why's (Poignant) Guide to Ruby but after taking a look at it, I don't know if it is for everyone. Found this site which seems to offer several tutorials for Ruby on Rails. Programming Ruby - suggested as a great reference for all things ruby. Found this site which seems to devote itself to visual basic tutorials. Not sure how good they are though. The main PHP site - A simple tutorial that allows user comments for each page, which I really like. PHPFreaks Tutorials - Various tutorials of different difficulty lengths. Quakenet/PHP tutorials - PHP tutorial that will guide you from ground up. C# Station Tutorial - Seems to be a decent tutorial that I dug up, but I am not a C# guy. The Seasoned Schemer - Followup to Little Schemer. Structure and Interpretation of Computer Programs - The definitive book on Lisp (also available online). Practical Common Lisp - A good introduction to Lisp with several examples of practical use. What about you guys? Am I totally off on some of there? Did I leave out your favorite language? I will take the best comments and modify the question with the suggestions. I know this is going to seem old-fashioned, but I don't think much of using online tutorials to learn programming languages or platforms. These generally give you no more than a little taste of the language. To really learn a language, you need the equivalent of a "book", and in many cases, this means a real dead-tree book. If you want to learn C, read K&R. If you want to learn C++, read Stroustrup. If you want to learn Lisp/Scheme, read SICP. Etc. If you're not willing to spend more than $30 and a few hours to learn a language, you probably aren't going to learn it. These are all really good, written by academia and (some) are books (an unpublished oreilly book --translated from French, but no issues I've found), for example). I've *'d my favorite ones that helped me the most. For C++, I suggest Accelerated C++ by Koenig and Moo as a beginning text, though I don't know how it would be for an absolute novice. It focuses on using the STL right away, which makes getting things done much easier. Real World Haskell, a great tutorial-oriented book on Haskell, available online and in print. Learn you a Haskell for Great Good, in the spirit of Why's Poignant Guide to Ruby but more to the point. Write yourself a Scheme in 48 hours. Get your hands dirty learning Haskell with a real project. Effective Java is a must but I recommend being comfortable with Java first to fully understand the examples. Can't believe nobody has mentioned the Perl Best Practices. There's also a Twitter feed that delivers one PBP per day. I learned Perl from Robert's Perl Tutorial, which I recommend, but it hasn't been updated since 1999. A newer recommended tutorial is Steve's Perl Tutorial. For web development with Perl, the clear winner is Catalyst, and the Catalyst wiki is the starting point for learning. For Lisp and Scheme (hell, functional programming in general), there are few things that provide a more solid foundation than The Little Schemer and The Seasoned Schemer. Both provide a very simple and intuitive introduction to both Scheme and functional programming that proves far simpler for new students or hobbyists than any of the typical volumes that rub off like a nonfiction rendition of War & Peace. Once they've moved beyond the Schemer series, SICP and On Lisp are both fantastic choices. Many of them are fully formed, and quite a few have more advanced sections (which are in varying states of completion) on specific functionality. their html and css sections are good for reference too. The first one is good for beginners and the second one requires more advanced level in C++. C - The C Programming Language - Obviously I had to reference K&R, one of the best programming books out there full stop. C++ - Accelerated C++ - This clear, well written introduction to C++ goes straight to using the STL and gives nice, clear, practical examples. Lives up to its name. C# - Pro C# 2008 and the .NET 3.5 Platform - Bit of a mouthful but wonderfully written and huge depth. F# - Expert F# - Designed to take experienced programmers from zero to expert in F#. Very well written, one of the author's invented F# so you can't go far wrong! Scheme - The Little Schemer - Really unique approach to teaching a programming language done really well. Ruby - Programming Ruby - Affectionately known as the 'pick axe' book, this is THE defacto introduction to Ruby. Very well written, clear and detailed. Let's not forget Head First Java, which could be considered the essential first step in this language or maybe the step after the online tutorials by Sun. It's great for the purpose of grasping the language concisely, while adding a bit of fun, serving as a stepping stone for the more in-depth books already mentioned. Sedgewick offers great series on Algorithms which are a must-have if you find Knuth's books to be too in-depth. Knuth aside, Sedgewick brings a solid approach to the field and he offers his books in C, C++ and Java. The C++ books could be used backwardly on C since he doesn't make a very large distinction between the two languages in his presentation. Whenever I'm working on C, C:A Reference Manual, by Harbison and Steele, goes with me everywhere. It's concise and efficient while being extremely thorough making it priceless(to me anyways). Languages aside, and if this thread is to become a go-to for references in which I think it's heading that way due to the number of solid contributions, please include Mastering Regular Expressions, for reasons I think most of us are aware of... some would also say that regex can be considered a language in its own right. Further, its usefulness in a wide array of languages makes it invaluable. One exercise I really liked was after they explained data types, they show a picture of a city street and say "label all the data types you can find in this picture." So the blinker on a car is a boolean, the sign on the store is a string, and the address is a number. That helped me get the idea of how to translate real information into a program. Based only on this book, I'd say the Head First series is a great way to learn something the first time, but the story-like format they have would make them difficult to use as references. Given recent developments I think it's important to include the recent explosion of free online course offerings from universities and private companies. The new boston is a tutorial site i've always used for numerous languages for years, great beginner point. I second Kristopher's recommendation of K&R for C.
I've found the "Essential Actionscript 2.0" book quite useful for AS coding (there's an AS3 version out now I believe). I've found that having real books to thumb through is more helpful than an online reference in some cases. Not really sure why though. hmm, I don't know if I would say that online materials are useless, but I do agree that there is something about books. Maybe they are better written, or maybe it is the act of forking over $50 that makes you more inclined to study the material. Either way, I agree that books should be part of this question. If anyone has any suggestions for books for languages I will edit the post with the best suggestions. The reference you have listed for Ruby is for Ruby on Rails. While still ruby deep down, it is definitely not a place to start for people wanting to learn Ruby. For Ruby tutorials, I would suggest Why's (Poignant) Guide to Ruby as a great starting point for anyone interested in the language. If you would want to get into more detail, I would recommend the book Programming Ruby, which has become the standard for all things Ruby. The third edition is currently being written, highlighting Ruby 1.9 features, so I would hold off for a while if anyone is considering buying this book. For Java, I highly recommend Core Java. It's a large tome (or two large tomes), but I've found it to be one of the best references on Java I've read. I know this is a cross post from here... but, I think one of the best Java books is Java Concurrency in Practice by Brian Goetz. A rather advanced book - but, it will wear well on your concurrent code and Java development in general. The defacto standard for learning Grails is the excellent Getting Started with Grails by Jason Rudolph. You can debate whether it is an online tutorial or a book since it can be purchased but is available as a free download. There are more "real" books being published and I recommend Beginning Groovy and Grails. C# to the Point by Hanspeter Mössenböck. 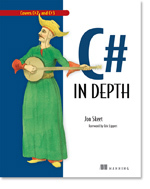 On a mere 200 pages he explains C# in astonishing depth, focusing on underlying concepts and concise examples rather than hand waving and Visual Studio screenshots. For additional information on specific language features, check the C# language specification ECMA-334. Framework Design Guidelines, a book by Krzysztof Cwalina and Brad Abrams from Microsoft, provides further insight into the main design decisions behind the .NET library. Is there a programming language with built-in state machine construct? Is Haskell suitable as a first language? If functional languages are really concise, why don't they have a better rank in the language shootout game? history of programming language names? Reserved keywords count by programming language?